The home-coming of Charles II, May, 1660 by W. Van der Velde (by permission of Messrs Geo. Bell and Sons). The period after the Restoration of the monarchy under Charles II (1660 onwards) was an important time in the history of yachting. 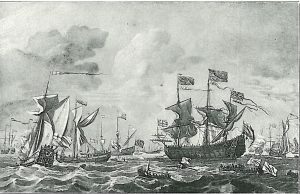 Charles brought back with him experience of the Dutch maritime scene, as well as ships with a variety of rigs. It was about this time that the idea of privately-owned vessels began to take hold. Competition between them then provided the spur to encourage experimentation with hulls and rigs. This chapter is divided into five sections for the web. Click here to start reading or download a pdf copy of the chapter.